Cutaway from the John Ford film, "Stagecoach" (United Artists, 1939)  the movie that "made" John Wayne. Ford evidently liked Beale's Cut, because he used it at least three times before: in "Straight Shooting" (1917, with Harry Carey), "Three Jumps Ahead" (1923, with Tom Mix) and "The Iron Horse" (1924, with George O'Brien). 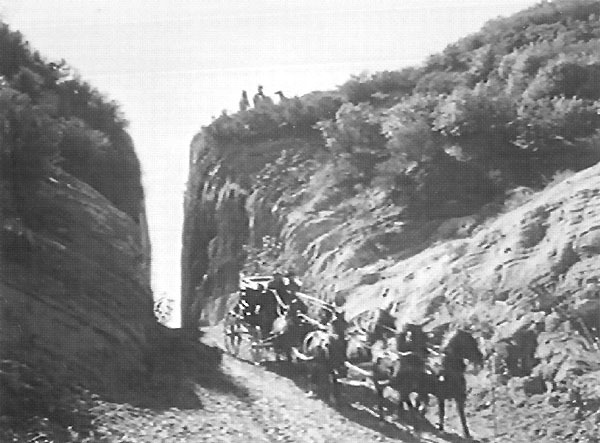 In this scene, Dallas (Claire Trevor), the Ringo Kid (Wayne), Lucy Mallory (Louise Platt), Mr. Hatfield (John Carradine), Doc Boone (Thomas Mitchell) and Peacock (Donald Meek)  with Buck (Andy Devine) driving and Curley (George Bancroft) riding shotgun  are supposed to be making the trek northeast out of Tonto (near Bisbee, Ariz.) to Lordsburg, New Mex. Actually, they're driving westward through Monument Valley, then they're in Beale's Cut (shown here), then they're in Monument Valley again  all the while being chased by Apaches, who were played by Navajo. Note the "Indians" poised for attack on top of the eastern ridge. There is no reason to believe the headline actors were in the stagecoach during the filming of this scene.